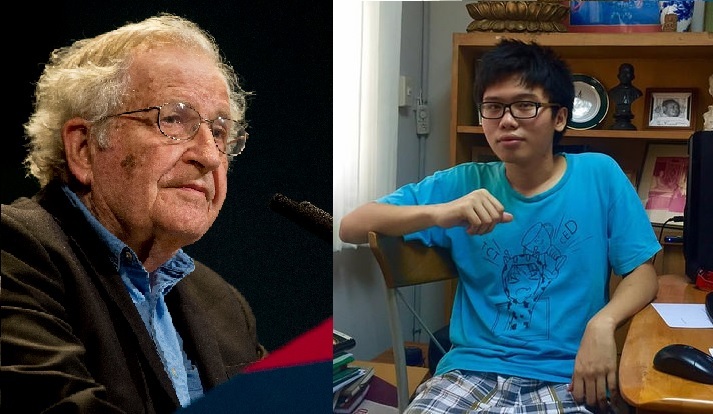 World scholars including Noam Chomsky have expressed support for Netiwit after Chulalongkorn University initiated disciplinary action against the progressive student activist. On 14 August 2017, Netiwit Chotiphatphaisal, President of Chulalongkorn University’s student council, posted on his Facebook account an email from Noam Chomsky. Chomsky wrote to express his hopes that the persecution against the activist will soon end so he can continue his mission to promote democracy. “I have learned, with dismay, about the ugly treatment to which you have been subjected, and the serious threats against you for standing up for justice and basic rights. Thailand is going through difficult days, and it is people like you who can pave the way to a much brighter future. I hope and trust that the unjust persecution will soon end and that you can continue with your admirable and courageous efforts to lead the way forward,” read Chomsky’s email to Netiwit . On 10 August, Chulalongkorn University (CU) initiated a disciplinary investigation  against Netiwit and seven other student activists after they staged a symbolic protest  during a university initiation ceremony. Netiwit was further accused of using university premises without permission when he hosted a public hearing at the Student Council office to hear complaints and requests about a CU commercial development project. But it is not just Chomsky backing Netiwit. On 14 August, the Thai Academic Network for Civil Rights (TANCR) published a statement  signed by 128 academics condemning the investigation. The statement argues that the activists’ protest is an exercise of basic rights and freedom. “If CU rules that these students did wrong, it is equivalent to sending a message to people nationwide that in the future, if any younger generation dares to exercise the rights and freedoms which are fundamental to them, to question the practices, norms, traditions and beliefs of those who have power, they will also be punished,” read the statement. The TANCR also urged the university to understand that the world is changing and those who stand against this change usually end up facing harsh criticism. “If the country’s leading university cannot understand this basic issue, the efforts to pour tremendous resources into climbing up the rankings to become a leading world university are senseless,” added the TANCR.